Do you mamas know how much I love Rockin' Green? Do you remember my Rockin' Green Automatic Dishwasher Detergent Review or my Rockin' Green Laundry Detergent Review? 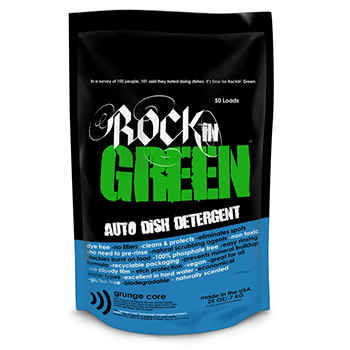 I'm excited to share that Rockin' Green is going to be giving one of our readers a package of their Automatic Dishwasher Detergent. What's special about Rockin' Green Dish Detergent? Excellent in hard water - no need for boosters or rinse aids! The amazing peeps over at Rockin' Green are giving one of our readers a package of Auto Dish Detergent! I'd like to try their femme rock! I'd also like to send this to my daughter: classic-rock-laundry-detergent-bare-naked-babies for her new babies laundry. I'd like to try their hard rock detergent. I would like to try the Hard Rock Laundry Detergent Lavender Mint Revival. I like their Motley Clean Laundry Detergent. I'd love to try the Funk Rock Ammonia Bouncer and maybe we can start cloth diapering at night again! I would like to try the Lavender Mint Laundry Detergent. I'd like to try the smashing watermelons soap. I'd love to try the Classic Rock Laundry Detergent - Mötley Cleän. I need the diaper sprayer. Thanks! Dog house green would be fantastic to try. This is good for safely cleaning the dog toys along with bedding. I'd like to try the Soft Rock Laundry Detergent - Bare Naked Babies! I would love to also get the diaper sprayer. I love love love Rock in Green hard rock detergent and would love more of that. I'd also like to try funk rock for my microfiber. I would like to try Doghouse Rock - Pet Toy and Bedding Detergent. I'd love to try the Classic Rock Laundry Detergent in Lavender Mint Revival. I love the names,lol.I want the hard rock laundry soap in bare naked babies! I'd like to try the Melody Odor Neutralizer & Fragrance Spray - Mötley Cleän.